This week over at the Jingle Belles blog they want us to make text the focus of our project. This one stumped me, I had a hard time with it for some reason. I went through my paper stash and found this paper from Carta Bella that has the words from 'Twas the Night Before Christmas on it. 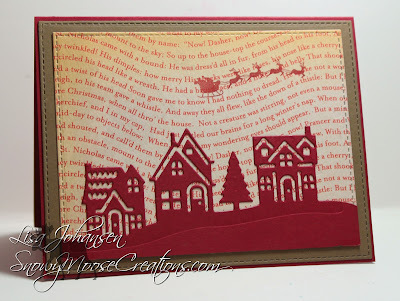 After staring at it for a while I cut out a panel with a stitched die and then used a die from Stampin Up to cut out the houses. I then took a stamp of Santa flying through the air and stamped that above the houses. I used red to keep with the theme of the text on the paper, with a brown border behind the text panel. The die cut village is perfect against the text-filled sky ... so very glad you got texty with us at jingle belles.